This post was written by Nick, a new member of our Customer Success team. Before joining Rise Vision, Nick was a digital signage novice so he thought it would be interesting to document some of his learnings over the past 3 months. 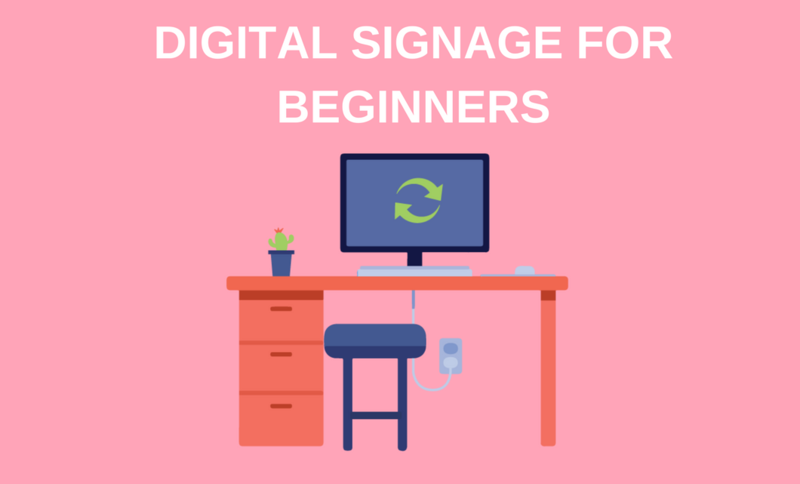 Want to see what a digital signage beginner has to share? Read on. Prior to joining Rise Vision, my only understanding of digital signage came from joining our AV Club in middle school. In 8th grade, I helped to post announcements and menus on our cafeteria’s TVs. We used Microsoft Publisher. The presentations weren’t particularly beautiful, but they displayed the messages that every student needed to see. Sloppy Joe’s are Thursday’s plat du jour. Please don’t rollerblade in the hallways. Now that I’ve worked with Rise Vision for three months, I’m beginning to shed my digital signage beginner status. Speaking with hundreds of our customers has allowed me to understand the affordability and simplicity that we can offer to any organization interested in digital signage. I’ve learned from our customers that getting started for free, without committing to a long term digital signage strategy, has allowed respective organizations to ease their way into deciding which direction is best. Below are some of the lessons I've learned along the way and I hope they can be helfpul if you're just starting out on your digital signage journey. It’s true that some of our customers pay for a number of subscriptions across an expansive display network. Some organizations have thousands of displays spread throughout the world. But, when speaking to these customers, I learned that before an organization rolls out an enormous display network, it was once a digital signage beginner, too. The organization’s that currently have artfully-developed presentations, advanced schedule-management all started with just one display and one presentation. At some point, we all are beginners. As beginners, one of the first question that we always like to ask is, “What are your digital signage goals?” What are you trying to accomplish with our services? And how can we help you to meet whatever your goals are? So, whether you’re just trying to impress your visiting CEO with some presentations or have developed a comprehensive digital signage strategy for your campus, I've learned that you have to really narrow down on what it is you want your digital signage to accomplish. Do you want to increase event attendance? Help visitors find their way in your building? Whatever it is, when you know your goal it's much easier to get started. Need some help with deciding your goals or want to talk this through with someone? We're always here to help. Every digital signage project starts the same away. You have a brilliant idea that you want to show on a display. So, what now? What are your next steps in making this idea look amazing? A common bit of trouble we commonly hear from our customers, especially digital signage beginners, is how to create beautiful and catchy content. Flash content is how you first catch the eye of your audience after all. Great content starts with an idea, but understanding the message that your audience wants to see is what helps you to create great content. You need to step inside the shoes of your audience and understand what they want to see, and what will resonate with them. This is where you want to consider how you can optimize your audience's experience with digital signage. Once you put yourself in your audience’s mind, you can fully understand the message you want to convey by exploiting opportunities that were not initially apparent. If you need some help thinking of what could resonate with your audience, check out 101 Digital Signage Content Ideas for some inspiration. One thing I've learned through all of this is to keep things simple. Sure, it may be tempting to want to try anything and everything in an effort to stand out from the competition. However, if you're just starting out, my biggest piece of advice would be to start small and then scale. Once you have made a business case for your digital signage, feel comfortable with what it takes to update and manage your network, then it's easy to expand. One thing to keep in mind is that some digital signage software providers require a minimum purchase of displays, so keep that in mind as you begin your search. At Rise Vision, we offer unlimited users and unlimited displays even on our most basic plan, which is free! Our pricing is also listed here so we're completely transparent about what you get. How Do I Get Started with Digital Signage? Still have questions? We have a lot of resources on our blog to help you with your digital signage! Check out the list below, or get in touch to see how Rise Vision can help your business or organizaton get started. Ready to Start Your Digital Signage Project? Sign Up for Free Today!